A quick heads up on this weekend's Mackinac Island activities. 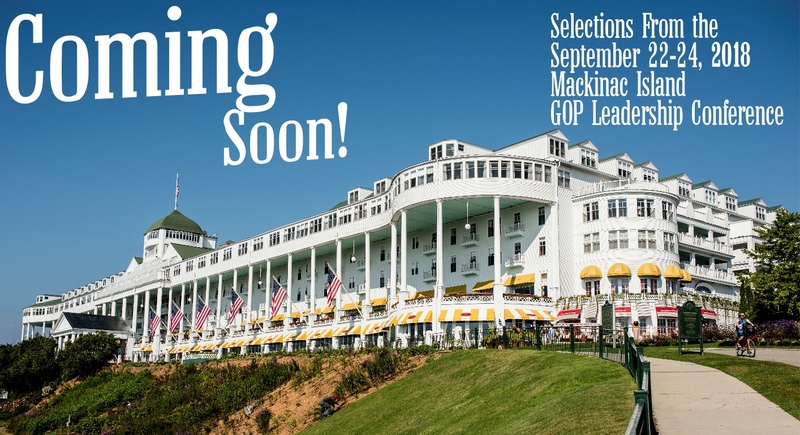 Decompressing from the Michigan Republican Party’s Mackinac Island leadership conference. “Together We Rise” was this year’s event theme, and the invited speakers were phenomenal. Speaking over the weekend to the Michigan Republicans was Governor Matt Bevin of Kentucky, Governor Eric Greitens of Missouri, Former U.S. Representative Jason Chaffetz of Utah, and U.S. House Majority Leader Kevin McCarthy. The Grand Hotel on the island was the setting for this year’s event (as well as all before), with several panels and opportunities to socialize. Coming away from the conference a few questions remain on what we might see on a couple of major races. As yet (unless I missed something), lt Governor Brian Calley has not yet declared his candidacy for Governor, and the lack of organizational element present on the island suggests he probably will not. Likewise the question of whether the US Senate race will also include U.S. representative Fred Upton is unanswered. the latter item may well have been answered with the new design of his political paraphernalia, showing no seat designation, and including the state as a whole, instead of a district. Upton had people on the ground and his own rally, something not usually seen for a simple win congressional re-election campaign. I have over a thousand pictures to process, and will get back to this as soon as I can. It's only 1000 pictures. . .aren't you done decompressing yet? Gentleman's wager... it'll be another big dud like the bridge walk hoopla. Jason struggles within the Trump era. Sad! Why the hate? One would think I pissed in your best scotch. No hate here. Project much? CS cut Jason some slack--I was at the bridge walk hoopla--and came away with the notion that it was a "security" training exercise for future. I would estimate there was about 60K there just to walk the bridge and another 20K or so who stayed on the mainland--not to mention the 10K or so they didn't let walk due to time constraints. I never saw so many police/security all in one place. Thing is, I'll never do this again as the only thing learned: it was extremely difficult to purchase a cup of coffee. Everybody understood the Democrat Governor's invented "bridge walk." Paris? London? Nah, Trump isn't putting up with it. Sue, Barb, whichever you like to go by here, think bigger picture. Peddling China manufactured items from warehouses sometimes creates blinders for whom you defend. It doesn't take a single malt to figure it out, all it takes is just an aging, out of shape, cheep shot artist to attack. Typical loser Cuckservatisim. Still wondering what is with the negativity. Last I checked we generally agree on most things. As for projecting.. cheap shot? gotcha. No negativity here. Reality- deal with it. Jason-I especially liked the Blood moon one and can't wait. . .. As for CS--TSK, TSK.